Because of Split’s position and its proximity (and great transport links) to a number of islands and other coastal towns, it’s an excellent place to base yourself in if you plan on making a number of side trips during your stay in Croatia. Here we present you with some options for possible day trips from Split. Trogir is probably one of the best – and easiest – places to visit from Split and what a place it is to visit! A UNESCO World Heritage site, the town is situated on a small island (although connected to the mainland by a very short bridge) and its wonderful sights (including the must-see cathedral, possibly one of the best in Croatia) can be easily covered in a day. That leaves you plenty of time to enjoy a glass of something in one of the cafes along the Riva (the harbourfront), as well as time for a leisurely lunch or early dinner in one of the town’s great restaurants. You could also hop over another bridge to the larger island of Ciovo which has some good beach opportunities. To get to Trogir, take the local bus no. 37 from the suburban bus station in Split. (N.B. This is different from the main bus station, where inter-city buses depart from.) The journey time is approximately 40 minutes; tickets can be bought on board. Some of the inter-city buses departing from Split’s main bus station do also stop in Trogir, but by no means all. Taking one of these buses would be marginally quicker – about 30 minutes – but more expensive. Another option is the leisurely and very pleasant boat run by Bura Line. The boat departs from the dock close to Diocletian’s Palace in Split; it first stops in Slatine on Ciovo and then travels on to Trogir. At only 5km from Split, Solin is also an easy place to make a day trip to from Split. However, although it was historically important as a Roman settlement, few of its not-that-impressive ruins will be of interest to anyone other than archeology and history buffs – there’s not much else of note in the town. Founded by the Greeks and then an Illryian settlement, Solin – or Salona as it was known then – became a major Roman settlement, the largest in Dalmatia. 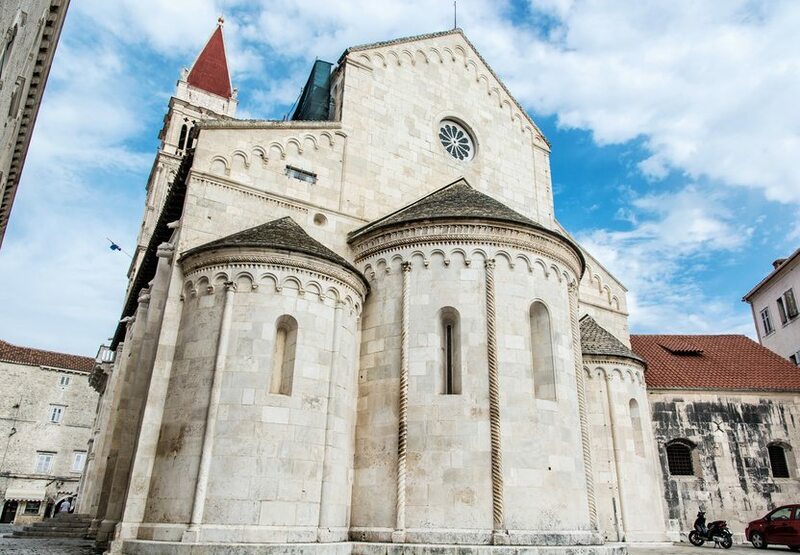 Roman Emperor Diocletian was born there, although he later built his famous palace in Split. At its height in the 1st century AD, Salona was thought to be home to 60,000 inhabitants. At that time, it also featured a large amphitheatre that could hold up to 18,000 spectators, as well as a theatre and a temple. When the Avars and the Slavs arrived in the 7th century, Salona was almost entirely destroyed and some of its inhabitants sought refuge in Diocletian’s Palace, and they (and their descendants) continued to live there and in the surroundings over the years – fuelling Split’s growth. These days, there’s not much left standing from Roman times. It’s possible to see the layout of the amphitheatre, although most of it is merely the foundations. Parts of the city walls and the remnants of a gate can also be seen, as can various other ruins. 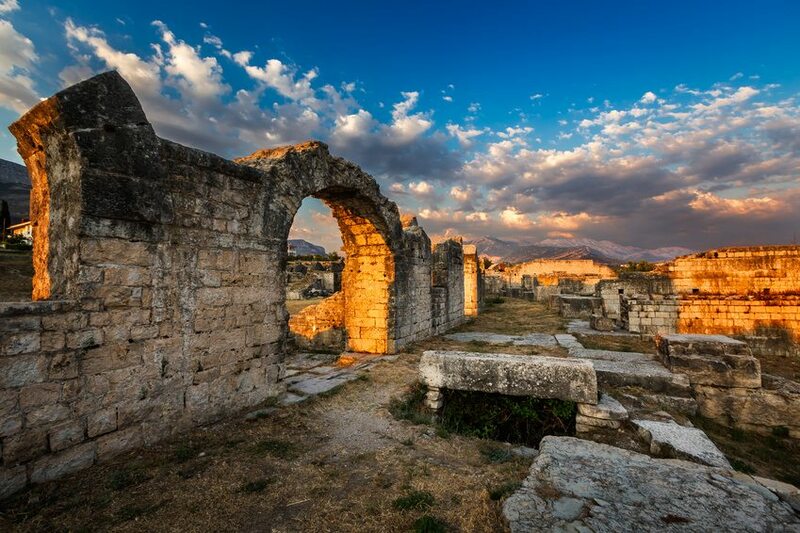 Solin isn’t a particularly popular tourist site, so if you have an interest in archeology and history then Solin’s worth the trip as you may well have the ruins almost to yourself. Stop off at the Tusculum, the archeological museum in town for guides and so on. To get to Solin, take local bus no. 1 from Split. You can buy tickets on board; the journey takes about 15 minutes. The small island of Solta (with a population of only 1,500) is an hour away from Split by ferry (with Jadrolinija) – and numerous ferries per day connect the mainland to the town of Rogac. Solta is a little off the beaten track in terms of tourism; despite its proximity to the mainland, it doesn’t really see particularly high visitor numbers. But that might sound ideal for you! Despite its lack of popularity, it’s still a great little place for a day trip. There are numerous little coves, bays and beaches around the island. As the island is reasonably quiet, many also take the opportunity to find their own private little seaside area and sunbathe in peace. Much of the island is covered in lush greenery and some woodland. Rogac itself is a pleasant little coastal village with its own beach and some cafes and restaurants. Maslinica, set among pine trees on the western side of the island, is more tranquil. The village of Necujam (which amusingly translates as “I can’t hear”) is more of a tourist settlement and has amenities such as pools, restaurants and bars – see more details at the Necujam Tourist Village website. Stomorska is the oldest village on the island, and quite picturesque as it sits at the base of a hill. Solta’s main town is Grohote, which is about 2km inland from Rogac. You can get around the island by bus or taxi, and it is possible to hire bikes in some of the villages. More details about the island from Solta Tourist Office. 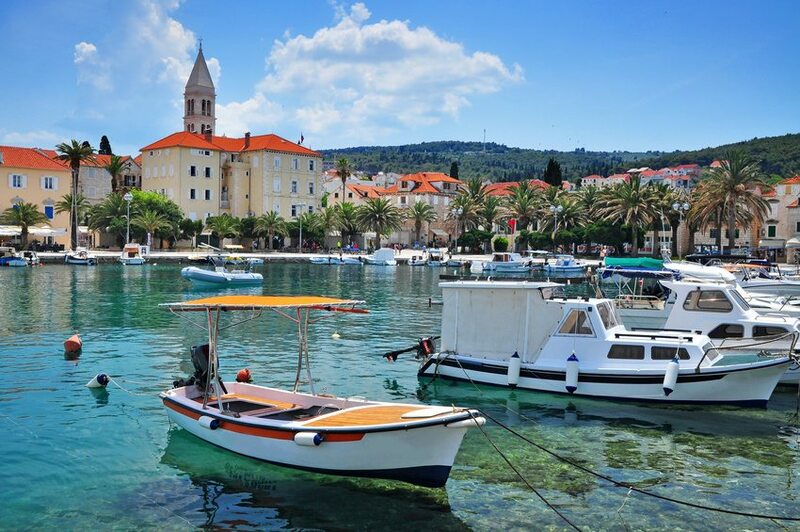 The larger and far more lively island of Brac is of course easily reachable from Split and there are several ferries and catamarans to various towns on the island. For a day trip, however, it’s probably best to really only consider the town of Supetar. On the northern side of Brac, there are numerous daily ferries (with Jadrolinija) to this town which take about 50 minutes from Split. Set around a pretty harbour, Supetar is the largest town on the island and is also a reasonably popular holiday destination in its own right. For sightseeing, there’s the parish Church of Annunciation from the 18th century, outside of which are situated mosaics from the 6th century. Near the harbour is a cemetery which contains a number of sculptures designed by Croatian sculptor Ivan Rendic (1849 -1932), who lived in Supetar for part of his life. Some of Rendic’s other works are on display in the library near the town harbour. Within the cemetery is also the bell-shaped mausoleum for the Petrinovic family, by Toma Rosandic (1878-1957). Most of Supetar’s beaches are to the west of the town if you fancy a bit of sunbathing! 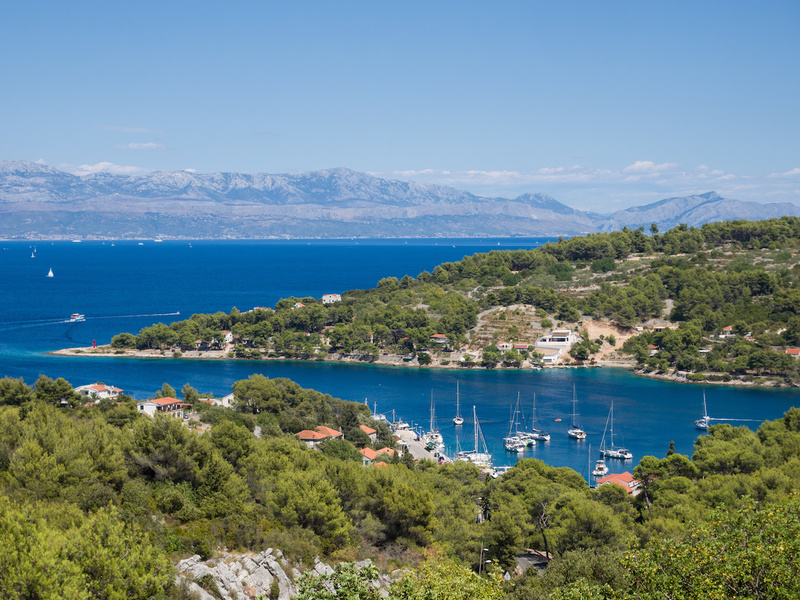 The ever-popular Hvar Town is now reachable as a summer day trip from Split thanks to improvements in the timings of catamarans from the mainland to the island. From early June to late September, Jadrolinija have morning sailings that depart Split just after 9am, getting you into Hvar Town 1 hour and 5 minutes later. In June, the return is in the mid-afternoon which doesn’t leave you with too much time on the island – but enough for a nice lunch and a leisurely stroll around town (and perhaps a climb up to Spanjola fortress for amazing views too – see above). From July to September, there is actually a return in the early evening so you can spend almost a full day on Hvar – get in some beach time too! Kapetan Luka‘s catamaran can definitely also be used for visiting Hvar – they in fact sail from Split to Hvar earlier (before 8am) with the return after 7pm. Journey time is 1 hour; there’s daily sailings June to September, and sailings a few times a week in May and October. 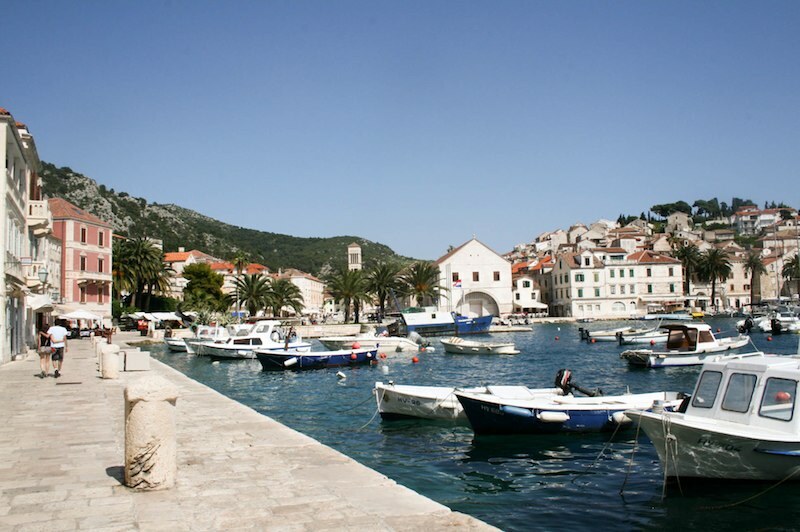 See our special section on Hvar for what to see and do on the island. The gorgeous Plitvice Lakes National Park isn’t reachable as a day trip from Split (without an organised excursion), so why not try the equally stunning Krka National Park instead? 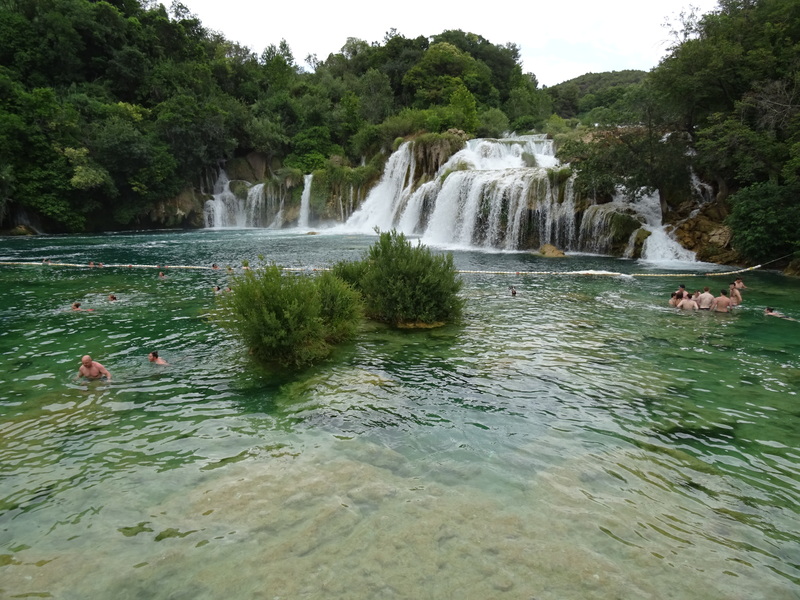 There’s a number of buses from Split to Skradin – where one of the entrances to Krka National Park is – and back; journey time is 1 hour 30 minutes each way so the Park is easily reachable as a day trip. Check out bus timetables on the Split Bus Terminal website.